If you want to spoil your best friend (whether they be a dog or a cat…), the plush, tufted and over-stuffed QuiteTime Deluxe Ombré Swirl Pet Bed by MidWest Homes for Pets is the perfect pet bed for you! Each pet bed is available in multiple sizes that are perfectly suited for almost any breed of dog or cat. These neutral color (mocha or gray) dog / cat beds will complement any home décor and provide your pet a cozy place to rest. All Ombré Swirl pet beds feature a “no-slip” surface on the bottom that’s perfect for hardwood or tile floors. They are machine washable and dryer safe, and they are sized to fit inside most standard dog crates creating a comfortable and desired location for your dog or cat to relax. Please note that the Quiet Time Ombre Swirl pet bed is not ideal for excessive “chewers” or dogs with high separation anxiety. If your dog is an excessive chewer, we suggest keeping a chew toy with your pet when in the crate in hopes your dog will chew the toy and not the pet bed. MidWest Homes for Pets stands behind the quality of our products with a 1-Year Manufacturer’s Warranty. If you have any questions regarding our dog beds or cat beds our customer service department would be glad to help you. MidWest customer service can be contacted at: 1-800-428-8560, available 9:00 AM – 4:00 PM, Monday – Friday EST. 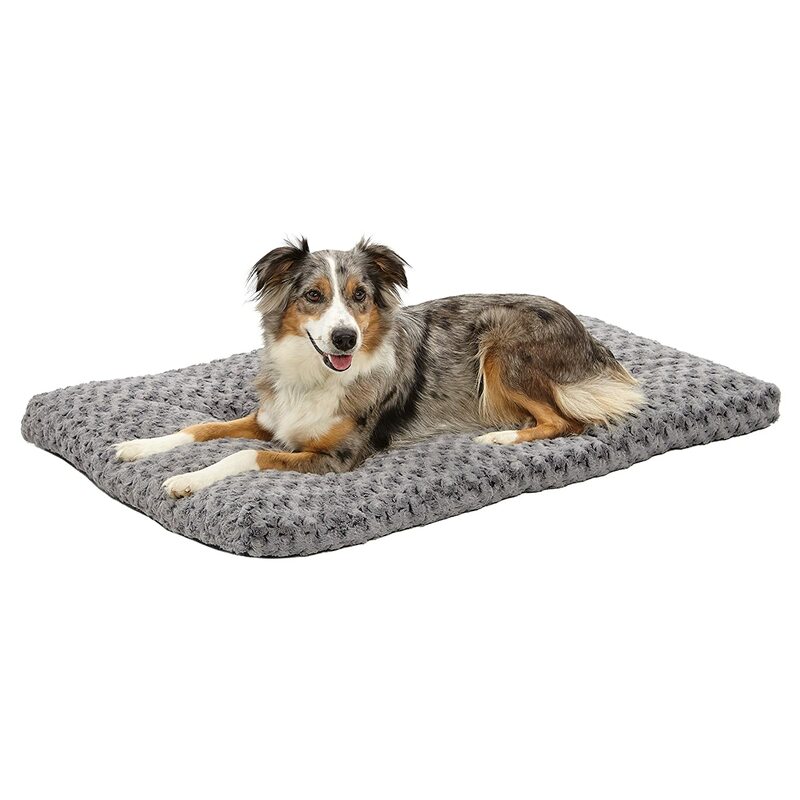 Dog bed looks great in the home | Ombré Swirl pattern & neutral gray color is sure to complement your home décor!